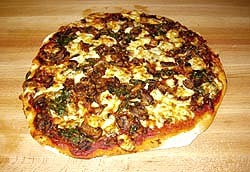 I thought that mushrooms, spinach, and bacon would make a good topping for this white wheat pizza crust. I have recently been using a white, whole wheat flour from the King Arthur Flour Company, that is as nutritionally healthy as regular whole wheat, but has a much milder flavor. I decided try experiment with the flour in pizza, and really liked the result. I used a mixture of half white flour, and half whole wheat. My green grocer had some nice, mixed mushrooms available, which inspired the topping for this pizza. I also used Fontina cheese in place of the usual Mozzarella which was a delicious addition to the other toppings. Preheat your oven to 425 degrees F. In a heavy pan, heat the oil, and add the onions and mushrooms. Cook over medium heat until tender and lightly browned. Add the garlic, and cook another couple of minutes. Set aside. Prepare your pizza dough, and after the first rising fit each ball into a pan prepared by lightly oiling or sprinkling with cornmeal. I used round pizza pans, but you could use baking sheets. Your dough should be at a thickness of about 1/2 inch. Spread over the sauce onto each of the prepared doughs, then add the mushroom mixture, spinach, and bacon. Divide the cheese evenly between the three pizzas. Bake for about 30 minutes or until golden brown and bubbly. Let sit 5-10 minutes before cutting and serving.